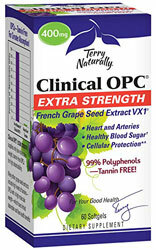 Clinical OPC Extra Strength by Terry Naturally, delivers 400 mg of VX1, a unique French grape seed extract. It's standardized for only small sized OPCs to better ensure absorption. LArge OPCs (tannins) in grape seed extract cannot be absorbed. VX1 offers the clinically recognized level of OPCs for consistent, life-enhancing benefits. Other Ingredients: olive oil, gelatin, glycerin, purified water, sunflower lecithin, beeswax, silica and annatto in sunflower oil (softgel color). Suggested Use: 1 softgel daily, may take up to 3 times a day for enhanced benefits.